Pinkadots Elementary : Tunes Tuesday, Teaching Grammar through Music Linky! Tunes Tuesday, Teaching Grammar through Music Linky! Thanks so much for the freebie! I have seen this idea on Pinterest, and I know my 4th graders will love it! Thanks for making it easy for me...easy is good! Thanks for sharing! I'm looking forward to your school supply link! Yay! Thanks so much for the kind words and for linking up! 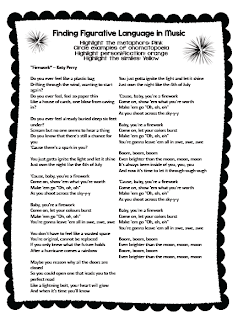 I love your lyric sheet, and I know my kiddos love this song! Love this song. I so inspired by all the great song lyrics everyone is posting for this linky! Grammar with be so much more fun this year! Thanks for sharing! The kids LOVE this song and definitely learn from it. This song is perfect for figurative language! Thanks for sharing your activity!